SPOILER ALERT: it sinks like a rock. But you knew that, right? And if you didn’t, believe me when I tell you that I have not spoiled the book for you. This tale is all about the journey, people, not the destination. World War I was in its tenth month in Europe when the Lusitania set sail on May 1, 1915, bound for Liverpool, England, from New York. One of the transatlantic “greyhounds,” she was the fastest ocean liner in service. In her 201 previous voyages across the Atlantic she had carried passengers from every walk of life, and this trip was no different. A Vanderbilt was on board that day, as were a theater impresario, great art and literary treasures, a clairvoyant, a young man with an engagement ring in his pocket for his English sweetheart, countless families with children, and three German stowaways who would quickly be found and locked away in the bowels of the ship. Thousands of pounds of provisions ranging from foie gras to tobacco, whiskey, and toilet paper were ready to serve passengers in every class of the ship, as well as hundreds of crew members. What could possibly go wrong? In February, Germany proclaimed the waters around the British Isles an “area of war” and, just prior to this crossing, the German embassy in New York issued an advisory regarding the danger from U-2 boats in the waters around England and Ireland. For months these submarines had plagued the area, sinking dozens of (often neutral) vessels and killing thousands. Still, the mood on board was generally gay. Passengers knew they were going into the belly of the war beast once they arrived in England. There were moments when conversation turned to “war and submarines” but many, if not most, passengers were determined to enjoy what was supposed to be a four day voyage. There is a wealth of source material – from passengers and crew members, rescuers, as well as White House, Cunard, and German archives – about this voyage. Larson must have read every word of it. His great gift is placing the reader right next to the soon-to-be-engaged young man and the clairvoyant at the dinner table. In the next chapter, you are in the White House with Woodrow Wilson as he struggles not only with the encroaching war issue, but also an unruly love life. Then you are onboard U-20, with its slightly-insane captain, as it roams the waters like a malevolent sea monster looking for targets. 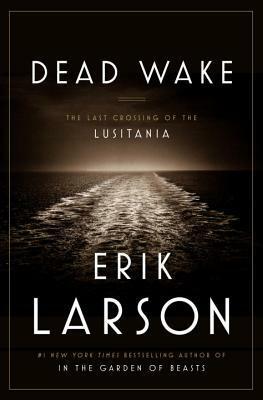 Turn the page and you are standing next to Captain Turner as he steers the Lusitania toward its destination. With the best of intentions, he makes decisions that quite literally change the course of history. Dead Wake transports you into a world gone by. You will recognize the precarious world in which its inhabitants lived, but it is nearly impossible to imagine the innocence in which they existed. It was a slower time, in which one waited for the arrival of a wire instead of an IM. As the inevitable approaches, the 21st century reader has to wonder what a difference the Internet might have made. Read this book. I promise you will love it. Give it as a gift. Your recipient will thank you. Very good review, now I really want to read it! Thanks, Karrol. I’m sure you will love it. And I think Dave would too. Thanks, Emily! I kind of loved it too. I am LOVING this book. Thanks for sharing your impressions. Oh, good! You so need something to do these days! Hehehe. Mainly need something to relax into and this sure fills the bill.